This is one of those fabrics that you really need to see in person to appreciate its beauty. It is VERY pretty--exceptional. 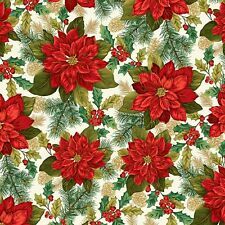 This fabric, by Henry Glass, is from their Winter Sanctuary collection. They are fabrics #2402 through #2410. This fabric is being sold by the half yard. This is one of those fabrics that you really need to see in person to appreciate its beauty. It is VERY pretty. 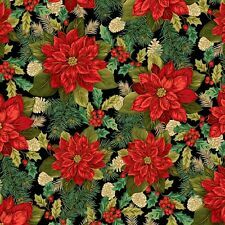 This fabric, by Henry Glass, is from their Winter Sanctuary collection. They are fabrics #2402 through #2410. I can see gorgeous table runners and place mats made out of this fabric! This fabric is being sold by the half yard. 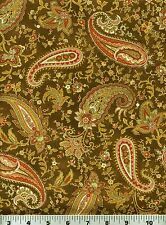 This beautiful paisley print from Henry Glass is from their Pheasant Run collection. This fabric is being sold by the half yard. This fabric, by Henry Glass, is from their Winter Sanctuary collection. They are fabric #2402 through #2410. This fabric is being sold by the half yard. This last option is the best to use if you have signed up for “streamlined” check-out. A rich autumn fabric by Henry Glass from their Autumn Festival Collection, with a pattern of tiny paisleys and florals in shades of avocado green against a lighter avocado green background. This fabric is being sold by the half yard. Fabric #2057 All-Over Floral Blue Purple Green Henry Glass 1 Pc. at 1 yard + 25"
This fabric features tiny purple bell-like flowers and small blue flowers, both with two-toned green leaves on a light blue and aqua background. This fabric features stripes (running lengthwise on the fabric) in reds, pinks, corals, and burgundys. This fabric is being sold by the half yard. This fabric features an all-over floral print of two kinds of leaves against a background of dark blue. This fabric is being sold by the half yard. A rich autumn fabric by Henry Glass from their Autumn Festival Collection, with autumn leaves in shades of orange, rust, gold, and green against a textured dark green background--also with acorns and berries. The pattern features orange pumpkins wearing crowns against a black background of subtle spider webs on black. The front of the crowns on the pumpkins have the skeleton cross and bones as a decoration. Name: Land that I Love Brand: Henry Glass Designer: Color Principle Studio Material: 100% cotton Weight: 4 oz./sq. yd. Size: 24"L x 44"W Fabric is uncut so multiple purchases will be shipped as one continuous piece. This new design is perfect for use in quilting projects, craft projects and even apparel. Krafty Kitties fabric. designed by Shelly Benton for Henry Glass and Co.
Land that I Love America Patriotic Banner Panel Cotton Fabric 36" x 44"
Name: Land that I Love Brand: Henry Glass Designer: Color Principle Studio Material: 100% cotton Weight: 4 oz./sq. yd. Size: 36"L x 44"W Fabric is uncut so multiple purchases will be shipped as one continuous piece. Henry Glass Fabrics. SOLD BY 1/2 YARD. 100% cotton fabric. SOLD BY 1/2 YARD. Cut from the bold. 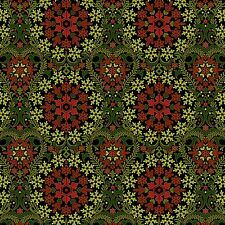 Henry Glass Fabrics. SOLD BY 1/2 YARD. SOLD BY 1/2 YARD. Cut from the bold. 100% cotton fabric. Content: 100% Cotton (not flannel). The price is for one panel. One panel is 1 yard, i.e. 36" x 45". Content: 100% Cotton (not flannel). Sold by the yard. Henry Glass Co Folio Basics by Color Principles. ~Sage Green~7755-60. Happy Quilting, Crafting and Sewing! By The Yard. 100% Cotton Quilt Fabric. 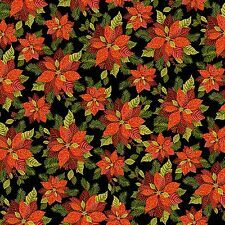 Botanica II Spring 7766 88 Henry Glass & Co 100% Cotton Fabric. PRICED BY THE HALF YARD. Fabrics priced by the 1/2 yard. YOU ARE buying a new, unwashed, piece of 100% cotton, fabric. order Quantity 2 for 1 yard, etc. Sold By The Panel. Each Panel can make to one book with 10 pages plus front and back covers. As shown in the picture, the blue border rectangle is 17 1/2" W x 9" H. It contains two pages. The full instructions are printed on the fabric ( as shown in the bottom of the picture). Content: 100% Cotton (not flannel). Henry Glass & Co "Foilio Basics". 7755-32~Sprig Dark Pumpkin. by Color Principle. By The Yard. Happy Quilting, Crafting and Sewing! By The Yard. 100% Cotton Fabric.